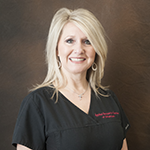 Rhonda Rowton is a Certified Clinical Research Professional (CCRP) through SOCRA. She started in pharmaceutical research in 1997 working with her Mentor, Jennings Osborne, at Arkansas Research conducting Phase I clinical trials. She has been involved in all aspects of clinical operations for Phase II-IV trials since 2010. She has study experience in Healthy male/female studies, Pediatrics, Pulmonary/Asthma, Allergic Rhinitis, Dermatology/Psoriasis, Hypertension, Hyperlipidemia, GI, Diabetic Type I and II studies, Osteo/Rheuatoid, and Pain Management trials. Rhonda serves as Director of Clinical Operations at Applied Research Center of Arkansas.